The need for security guards at large complexes, especially high-rise buildings, is extremely important and Citiguard is here for all of your security needs. When an issue arises, the on-site security guard will often be the first responder. Having an on-site specialized high-rise security guard will help make the tenants and guests feel well-protected at all times and will act as a deterrent to any trespassers and/or terrorist acts. Not only will Citiguard help ensure the safety of the tenants and guests, but we will also detour any and all trespassers with access control to all exterior doors and common areas tracking what is coming in and leaving the premises. Citiguard high-rise security officers Los Angeles help protect buildings 24/7 with the help of CCTV, are specifically selected for their people skills and then trained to provide security in a high-rise. Their standard 40 hours of training include first-aid/CPR, weaponless self-defense, ways to handle potentially physical confrontations without using force, how to be an effective witness in court, bomb detection and earthquake preparedness. In a high-rise building, the best place to go in an emergency is almost always down the stairs. Citiguard security protection guards are responsible for many evacuation details as spelled out in the Emergency Plan filed with the local Fire Department. Each security protection guard has an area of responsibility that also overlaps into other areas so that there is intentional redundancy. The level of security at a high-rise business building or luxury high-rise apartment complex can be extremely high, not only for the property owner/management company but for the tenants as well. It is extremely important for the tenants, guests and staff to feel safe and Citiguard is here to make that happen. 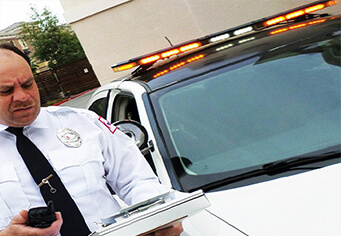 With specific high-rise security training, superior customer service, and proper telephone etiquette, your tenants, guests and staff will feel more at ease knowing a security guard from Citiguard is onsite at all times. Our security guards are trained in Behavior Detection. Having received specialized high-rise security protection training, our security guards are trained and ready to watch for suspicious behavior. Once suspicious behavior is noticed, it is the security guards job to “be nice” by confusing and delaying the individual. A terrorist does not want to be bothered, they are dialed in to whatever it is that their plan is and does not want to be distracted. A simple, “where are you headed today” and other “acts of kindness” will give our security guards the time to notice a change in behavior whether it is verbal or non verbal. Several of our clients that have switched to Citiguard, their insurance premiums were lowered drastically because of the Behavior Detection training these security guards possess. Once Citiguard meets with the property management company, together, we will come up with a strategic security plan with personalized post orders, an emergency evacuation plan, a personalized schedule, daily activity reports and much more to fit all of your security needs. Call Citiguard – security guard company at LA for your free high-rise building security assessment consultation.